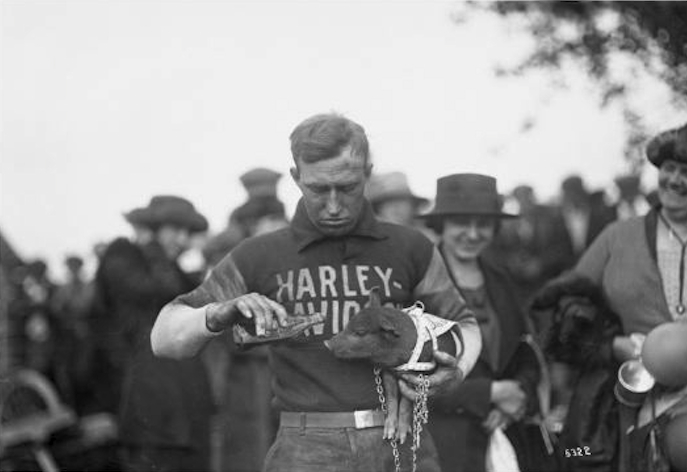 Harley-Davidson “Hog Boys” racer Ray Weishaar taking good care of the team mascot. The term “HOG” has been affectionately associated with Harley-Davidson for decades. It’s a workhorse term for the iconic motorcycle company that serves many purposes. Harley-Davidson is identified as HOG on the NYSE, they coined H.O.G. as an acronym for “Harley Owners Group”, and Harley-Davidson even attempted to trademark “HOG” IN 1999– and lost when it was ruled that “HOG” had become a common generic term used for large motorcycles, and therefore was unprotectable as a trademark. All that said, the ones originally responsible for the “HOG” handle were a roughneck group of farm boys that rode for the H-D racing team back in the 1910s-1920s who’d take their little pig mascot on a victory lap after every race their team won– giving them the name “Hog Boys.” They deserve a great deal of respect– more than one paid the ultimate price and left it all on the track for the sport that was their life– racing motorcycles. These guys also had their careers interrupted by our great country’s call to serve in WWI. More than likely, many of us today cannot begin to fathom the depth of their personal commitment and sacrifices. 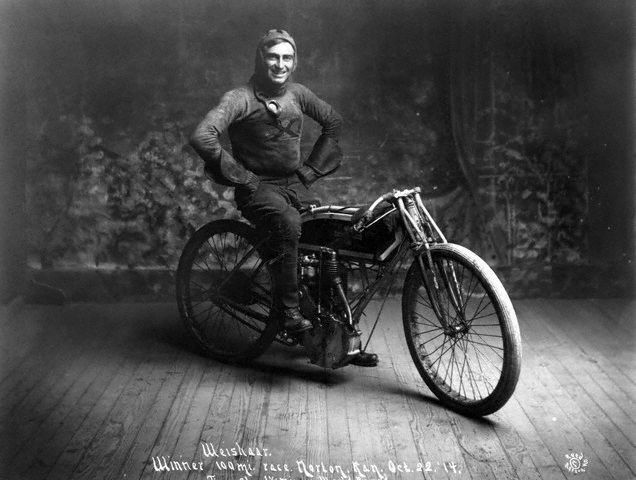 Ray Weishaar was undoubtedly one of the best known motorcycle racing stars of the 1910s and 1920s. 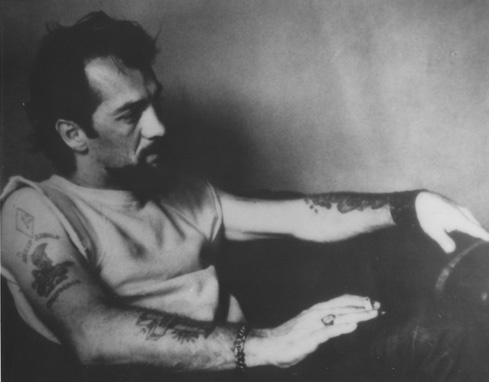 He rode the board and dirt tracks of the country for the Harley-Davidson factory racing team. 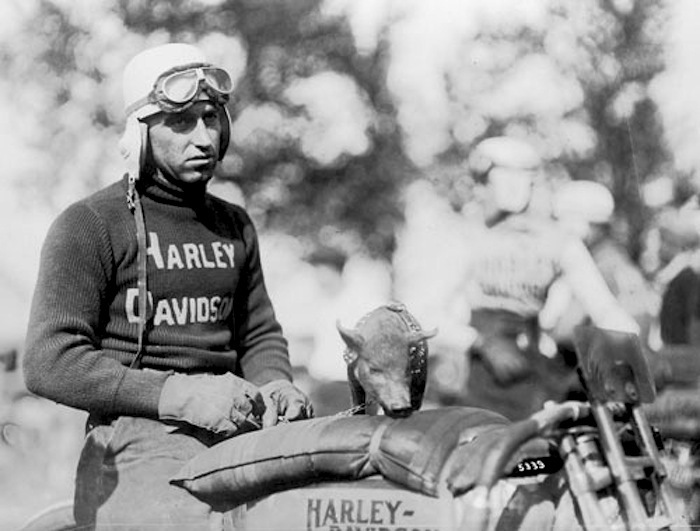 Ray Weishaar is seen here with the famous team Harley “hog” mascot on the tank of his bike. Ray Weishaar was coined the “Kansas Cyclone”– dominating the county fair circuits of Kansas from 1908 to 1910. He was a dominant racer– the Kansas State Championship two years in a row. His second win came even with his handlebars breaking halfway off– although he won the race, he didn’t break his previous year’s record. 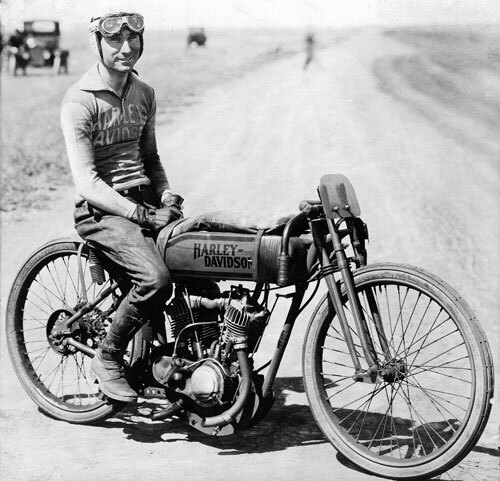 Ray Weishaar became part of the Harley-Davidson factory racing team in 1916, finishing third at Dodge City that year and winning the FAM 100-Mile Championship in Detroit. Weishaar was also offered a Harley-Davidson dealership and became a dealer for three years. Weishaar was by no means finished with racing though, and returned to the competitive circuit in 1919. Ray “Kansas Cyclone” Weishaar back in 1914. 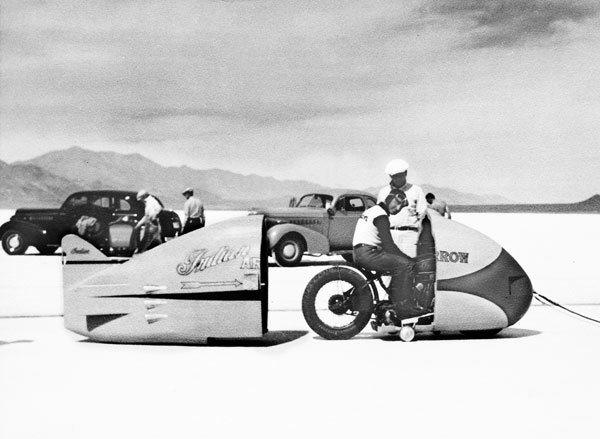 One fateful race, Weishaar was battling Gene Walker for the lead– Johnny Seymour drafted past them both, sending Weishaar’s bike into a high-speed wobble. The bike went into a skid and Weishaar fought hard to save it before hitting the outside fence. Weishaar went through the wooden fence and incredibly was still conscious. He was not thought to be seriously injured in the crash. His wife, Emma, drove him to Los Angeles General Hospital where he tragically died just a few hours later from internal injuries. The motorcycle racing community rallied to support Weishaar’s surviving wife and six-month-old son and generously paid off the mortgage on the family’s home. 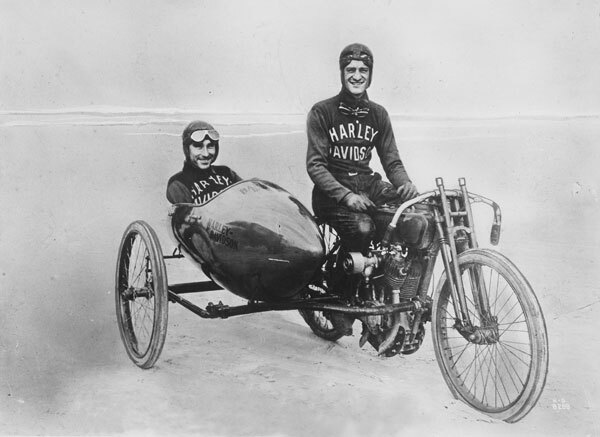 Leslie “Red” Parkhurst with fellow Harley-Davidson racer Fred Ludlow in the sidecar. “Red” has a sight to be seen, standing 6′ 4″ and topped with a mop of shocking red hair. He was also good friends with another sports celebrity and fellow Coloradoan– Jack Dempsey. 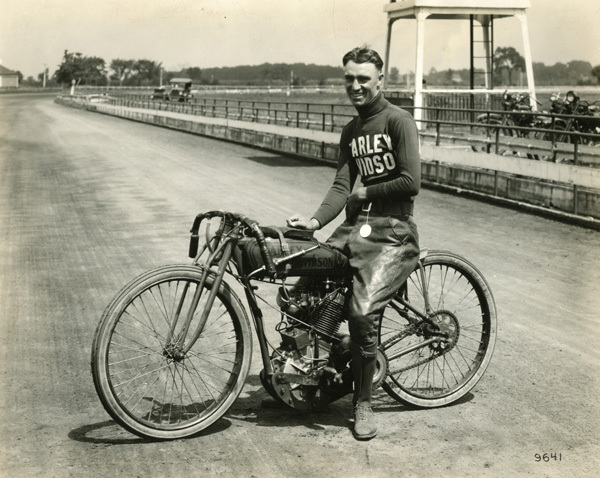 Harley-Davidson’s very first factory racer, Leslie “Red” Parkhurst, was somewhat of a celebrity among racing enthusiasts in those days– breaking 23 speed records and winning a slew of top national races for Harley from 1914-1920. He had a brief and unsuccessful stint at Excelsior in 1921, and quickly returned to Harley in 1922 to race for them again. By this time Parkhurst had a family, and his racing career slowed down considerably, with him competing only in select events. “Red” Parkhurst transitioned into a successful sales career for Firestone and Valvoline. 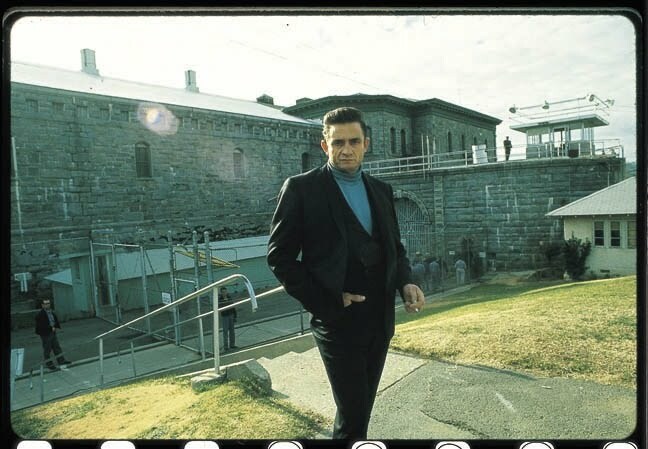 He retired in the 1960s and died in 1972 while living in Washington State at 76 years old. 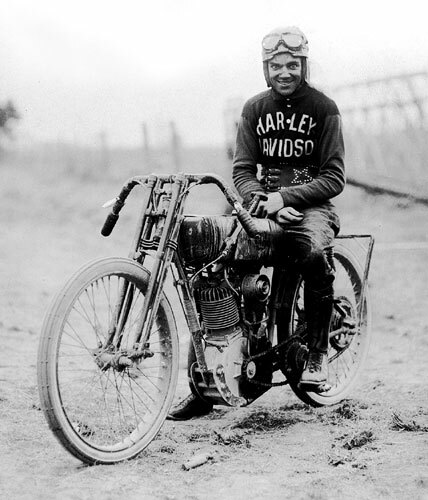 Albert “Shrimp” Burns, one of the top dirt and board track racers of the 1910s and early 1920s– riding for both the Harley-Davidson and Indian factory teams during his career. Burns was the youngest champion of his era, winning his first titles at the impressive age of 15. Albert “Shrimp” Burns was known as a gritty and tenacious racer who wouldn’t think twice about racing injured– his fiercely competitive heart made him a legendary crowd favorite. In typical Burns’ style, he once took a hard fall racing in Marysville, CA but was unfettered. Still shook-up he managed to get his bike back in shape and ready for the next race, and hopped back on to won the five mile final, which worked the crowd into a frenzy– all with a fractured collarbone and broken shoulder. In 1920, Burns shocked everyone by switching from Harley-Davidson to Indian. Back in those days, the rivalry between the two companies was so fierce that for a rider to switch from one team to the other was a big deal. 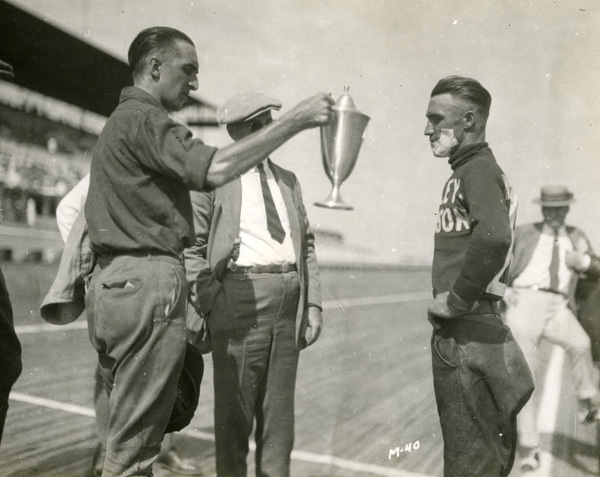 Burns felt he wasn’t getting his fair share of the limelight at H-D, and soon proved himself at Indian by taking home the very first national title of the 1920 season– winning the 25-mile national at Ascot Park in Los Angeles. According to reports, the crowd swarmed the track and carried the overwhelmed Burns on their shoulders, cheering until they were hoarse– proving beyond a shadow of a doubt that Burns was one of, if not the, most popular rider of his day. On August 14, 1921, Burns tragically lost his life in a racing accident in Toledo, Ohio. Coming out of a turn, Burns ran into the back of Ray Weishaar’s bike. The impact sent Burns into the railing and he later died of massive head injuries. Sadly, Burns’ fiancée, Genevieve Moritz, had come to Toledo to deliver a birthday gift and stayed to watch the race and witnessed the fatal accident. Motorcycling deeply mourned the loss of Burns. Numerous tributes were written about him for weeks after the accident. When he was 18 years old, Ralph Hepburn (below) took an offer to travel with a barn-storming group that rode the motordromes (board tracks) and dirt tracks across the Midwest. In 1916, Hepburn bought an ex-factory Excelsior and started earning podium finishes at the nationals. In June of 1919, Hepburn joined Harley-Davidson’s factory racing team, becoming part of what may have been the greatest factory racing team of all time with legendary teammates–Ray Weishaar, Albert “Shrimp” Burns, Maldwyn Jones, “Red” Parkhurst, Fred Ludlow and Otto Walker, all of whom would become Motorcycle Hall of Fame inductees. He won the M&ATA 200 Mile National Championship at Ascot Park in Los Angeles on June 22, and on July 4, 1921, Hepburn won the Dodge City 300, in perhaps the greatest performance of his career. It was the last running of that classic event and all of the factory teams and riders were on hand. Hepburn took the lead early in the race and went on to win the race by 12 minutes over second-place rider Johnny Seymour. Hepburn broke all existing 300-mile records in that race. The next year he signed with Indian. Hepburn tried his hand at sidecar racing in Milwaukee and went on to win one of the 1922 sidecar national titles. That year he also defended his 300-Mile National title. The race had moved from Dodge City to Wichita and was not backed by the factories. The promoters had to pay appearance money to get the top stars of the day to show up. Still, Hepburn turned in another great ride and won by 18 minutes. In 1923, Hepburn won the Pacific Coast Championship. 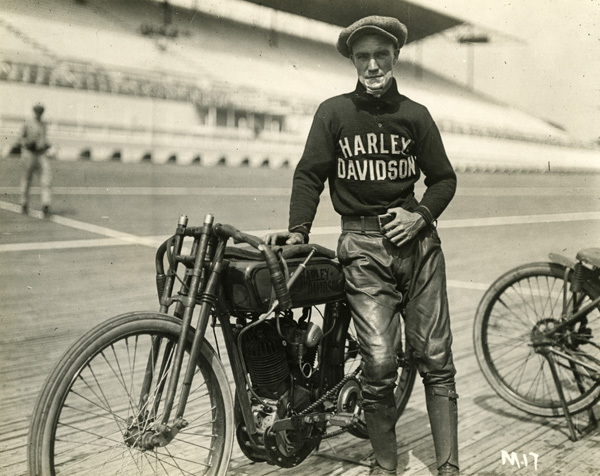 In 1924, he returned to Harley-Davidson and was runner-up to Jim Davis at the national finals in Syracuse. Also in 1924, Hepburn set a new speed record riding a Harley-Davidson. Ralph Hepburn tragically died in qualifying practice for the Indianapolis 500 on May 16, 1948. He led the world-famous race three times in three different decades (1925, 1937 and 1946). Hepburn set the Indianapolis track record in qualifying for the 1946 race, but didn’t start on the front row since he was not a first weekend qualifier. Hepburn came up just two seconds short of winning the Indy 500 in 1937, which at that point was the closest finish in the history of the race. His second-place finish that year was his best-ever result at that race. Ralph Hepburn was one of the great motorcycle racers of the 1910s and early 1920s, having won national championships racing for both Harley-Davidson and Indian. Hepburn was a star of the board tracks and dirt ovals, having won some of the seminal dirt track nationals such as Dodge City, Kansas, and Ascot Park in Los Angeles. During the mid-to-late-1910s, Maldwyn Jones (below) was perhaps the best dirt track racer in the Midwest– winning hundreds of regional dirt track events during his 13-year motorcycle racing career. During the mid-1910s, Jones was dominant on countless half-mile dirt-track ovals of the Midwest. In 1914, riding his Merkel, Jones won a highly publicized five-mile match race against a Mercer race car on a dirt oval in Dayton, Ohio. During this period, Jones’ racing, as well as bike and equipment design efforts kept Merkel in the spotlight even though the it had officially dropped its factory racing effort in 1910. With Merkel floundering, Maldwyn Jones accepted an offer to ride for team Harley-Davidson in 1916. Even though he was racing for Harley-Davidson, Jones continued utilizing the superior-handling chassis he had designed and developed with Merkel. In 1922, Jones was signed by Excelsior and was again runner up at the M&ATA 25-mile national dirt track championship in Milwaukee. Jones also started competing in motorcycle hillclimbing while riding for Excelsior and won a number of regional events. He retired from motorcycle racing altogether at the end of 1922 to work for Indianapolis-based Wheeler-Schebler Company– famous for its racing carburetors. Maldwyn Jones– well-known racer and racing motorcycle builder of the 1910s and 1920s. Fred Ludlow (below) was supported by Indian in the form of one of its new eight-valve racing bikes in 1914. He raced frequently around the circuits of California. The young Ludlow earned his share of wins despite having to go up against established veterans such as Don Johns, Morty Graves and the other top riders of that era. In 1916 and 1917, he focused his efforts on endurance runs and racked-up a slew of perfect scores in the long-distance contests. Ludlow served a brief stint in the Signal Corps during World War I, leaving for Europe in April of 1918 and returning from the war in August of 1919. Soon after his discharge, he was signed by Harley-Davidson’s competition manager Bill Ottoway to race for the Milwaukee-based team. Harley assembled a top-notch racing team in 1920. Known as the “Wrecking Crew”– it was chock full of talent, with Ludlow joining Ralph Hepburn, Otto Walker, Red Parkhurst and later, Jim Davis, Ray Weishaar and Maldwyn Jones, in one of the most powerful factory squads ever put together. Fred Ludlow was a top board track motorcycle racer of the 1910s who made the transition to the dirt track. Ludlow’s greatest accomplishment came in September of 1921, when he won five national championships at the M&ATA finale on the dirt mile at Syracuse, New York. Fred Ludlow successfully rode in most of great races of the day, such as the Dodge City 300. He achieved his greatest success on September 19, 1921, on the famous Syracuse (New York) Mile– with Ludlow sweeping all of the national titles that day. He was perfect with five wins in five races on his factory Harley-Davidson, besting most of the top stars of the day, including the likes of Jim Davis, Don Marks, and Ralph Hepburn. It was one of the most dominant performances in the history of the sport. Ludlow’s popularity grew and Harley-Davidson sent him across the country in a sidecar to host racing film shows for various clubs and organizations interested in motorcycle racing. Ludlow’s success at Syracuse in 1921 proved to be his swan song on the race tracks of America. He was fired by Harley-Davidson in 1922 and went to work as a mechanic for C. Will Risdon’s Indian dealership in Los Angeles. In 1923, he joined the South Pasadena Police Department as a motorcycle officer, and a year later transferred to the Pasadena Police Department. Otto Walker (below) was a leading motorcycle racer in the 1910s and early 1920s and was one of Harley-Davidson’s first factory riders. Walker won the first major race for the Harley-Davidson factory team on April of 1915– an FAM 300-mile road race in Venice, California. Walker set numerous speed records during his eight-year professional racing career. He earned the impressive distinction of being the first rider ever to win a motorcycle race at an average race speed of over 100 mph in 1921. Motorcycle racing legend Otto Walker in action. 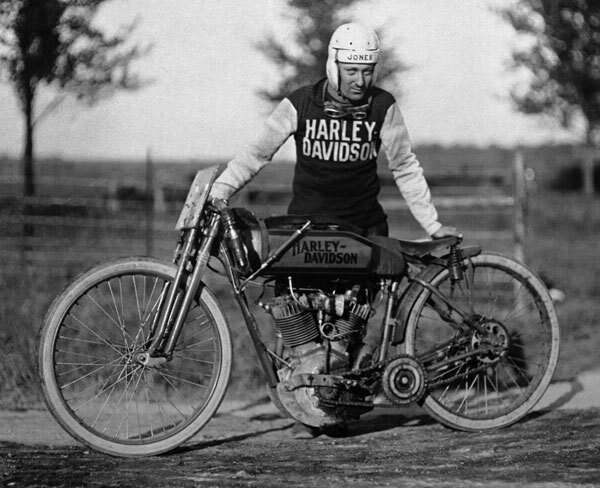 By 1914, Harley-Davidson was just getting into competitive racing and sponsored Otto Walker. By the end of that season he turned pro, but Walker’s pro career had no so sooner started when he was injured in a crash and forced to sit out the rest of the 1914 racing season. On April 4, 1915, Walker gave Harley-Davidson its first national victory when he won the 300-mile road race national held on the streets of Venice, California. That race was one of the biggest of the year and was contested by most of the major factory teams. Walker’s victory in that race over the established racing stars of the day was considered an upset even though he was riding for factory Harley-Davidson. Walker followed up the Venice win with an even more impressive victory in July of that year when he won the prestigious Dodge City 300, the biggest motorcycling racing event in America during that era. Even after a tire blowout and a broken lens in his goggles, Walker held on, and with a lap and a half remaining he passed Indian’s Morty Graves, who had run out of gas on the back straight with less than three miles to go. A souvenir from WWI became a signature look for Otto Walker– he began wearing a German aviator helmet instead of a standard motorcycle racing helmet during his races. Walker was also known for his unique riding style. He would arch his back on straightaways to give himself a better aerodynamic profile and his fellow competitors began calling him “Camelback” Walker. 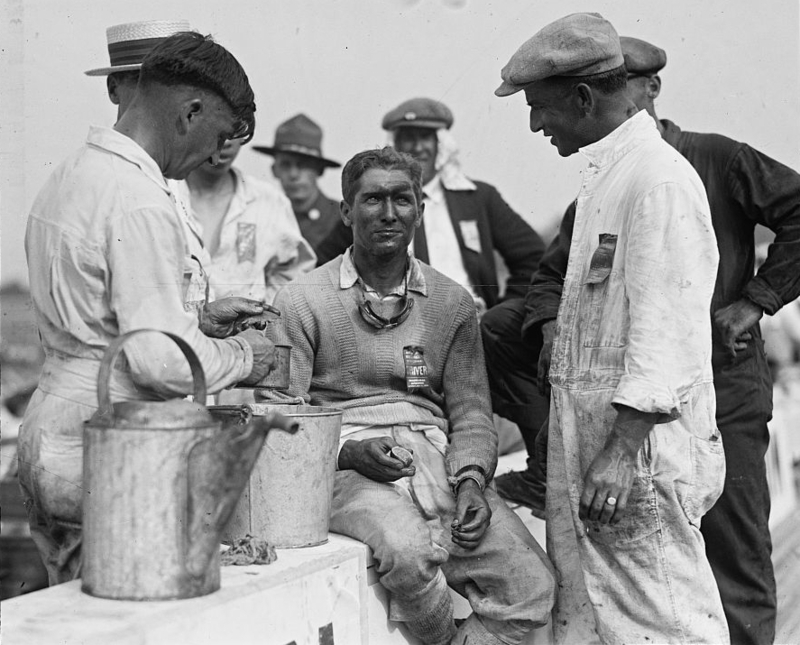 He retired after the 1922 racing season (as did fellow competitors “Red” Parkhurst and Maldwyn Jones). Walker ran a sport-fishing service on the Sacramento River and died in 1963 at the age of 73. An early Class A racing champion, Jim Davis was one of the few who won titles under the banner of the predecessors to the American Motorcyclist Association, the Federation of American Motorcyclists (FAM) and the Motorcycle and Allied Trades Association (M&ATA). He excelled in board-track racing and on dirt ovals. Davis also won the very first national race sanctioned by the AMA, the 25-mile AMA National Championship held on a one-mile dirt oval in Toledo, Ohio, on July 26, 1924. Jim Davis rode for both the Harley-Davidson and Indian factory racing teams. In addition to being a great racing champion, Davis also went on to become an AMA official– serving in various capacities including deputy chairman of competition. His most visible job with the AMA was as chief referee and starter. Davis earned 21 AMA national championships and a reported 50-plus pre-AMA national titles under the auspices of the FAM and M&ATA. Jim Davis receives the ten-mile winner award from E.C. Smith. In 1915, Davis happened to be at his neighborhood Indian dealership when Frank Weschler, head of sales for Indian, came to visit. The owner of the dealership introduced Davis and told Weschler of the 19-year-old’s racing exploits. The dealer asked Weschler if he might send Davis a factory Indian racing machine. Davis never expected anything to come of the casual meeting, but a few weeks later the dealer called Davis into the dealership. Davis was thrilled to find a brand-new eight-valve closed-port Indian factory racer with his name on it. In 1916, the Columbus Indian dealer took Davis to Detroit to race in the FAM 100-Mile National. Racing for the first time against unfamiliar competition, Davis, who weighed all of 120 pounds, looked at the group of grizzled veteran racers lined up for the Detroit final and considered them a pretty rough-looking bunch. Starting from the outside of the front row, Davis put his Indian first into turn one and was never headed for the entire 100 miles. 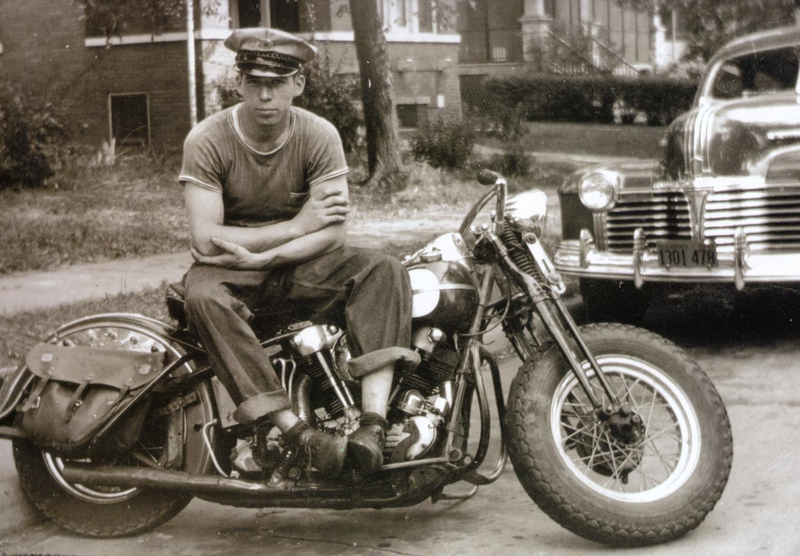 Jim Davis with Harley-Davidson board-tracker. Jim Davis’ employment as a factory Indian rider came to an abrupt end in 1920. He went to a race in Phoenix, only to find that it was an invitational and that only two riders of each motorcycle brand would be allowed to ride. Two Indian riders were already invited to race. Not one to be easily deterred, Davis got the referee to agree to let him race if he got a wire from M&ATA president A.B. Coffman. Davis went to the Western Union office down the street and through the persuasion of a big box of chocolates, convinced a young lady working there that he was merely wanting to pull a gag on a friend and got her to fake a telegram that simply read: “Permit Davis to Ride.” Signed A.B. Coffman. Davis then paid a young boy a quarter to ride his bike to the track and give the telegram to the referee. Davis watched as the ref opened the telegram and then waved Davis over and permitted him to race. The following week Davis paid dearly for his shenanigans when he was suspended for a year by one A.B. Coffman. To add insult to injury, Davis was also fired from Indian for the incident. In less than 24 hours after being fired by Indian, Harley-Davidson quickly hired Davis, took care of his suspension, and he continued to race the rest of the season. Motorcycle racing legend Jim Davis, circa 1931. 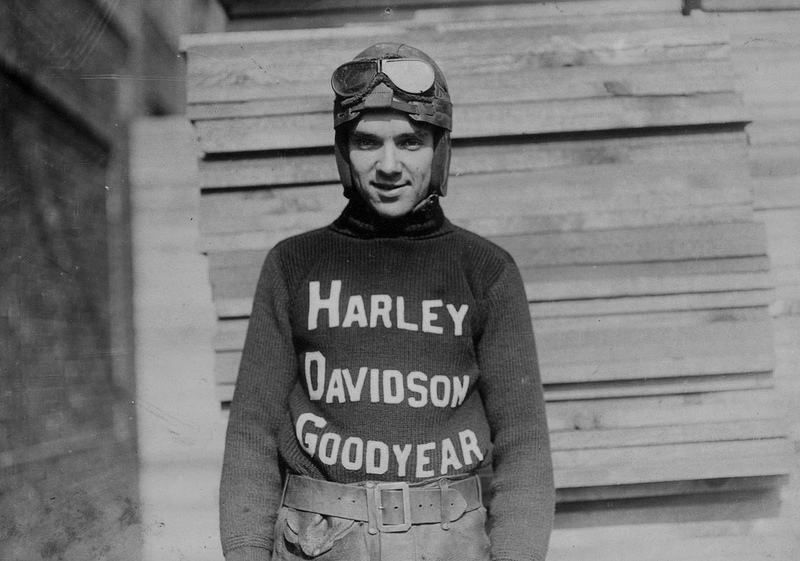 Jim Davis only raced for Harley-Davidson until 1925. Indian gladly re-hired him for the 1926 season and Davis promptly won three national titles that year on both board tracks and dirt ovals. 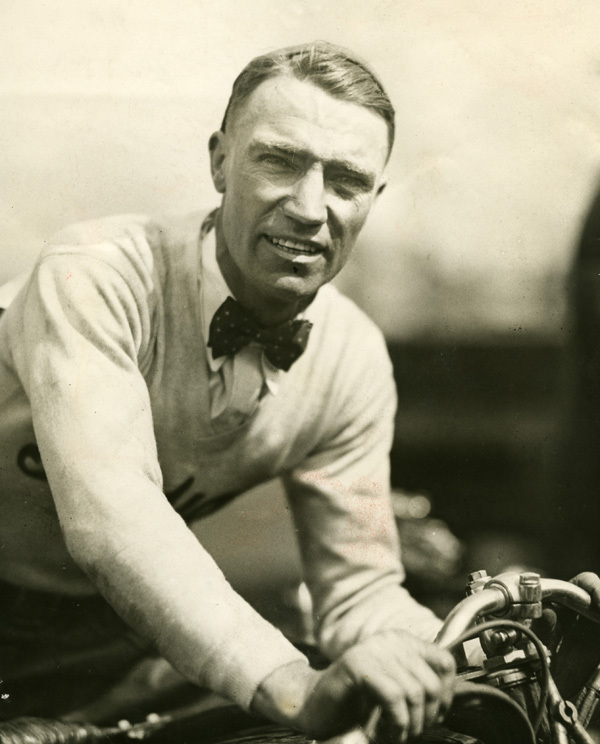 Davis’ most successful season came in 1928, when he won six national titles and was named the overall AMA national champion, a feat he repeated in 1929. Davis won his final AMA national at Syracuse, New York, in 1930. He continued to be a one of the top competitors for the next five years. After his retirement from racing, Jim Davis was instrumental in forming the motorcycle division of the Ohio State Highway Patrol. He worked for the Highway Patrol for 14 years. Afterwards, Davis went to work for his family-owned architectural business. He also became an official for the AMA. Jim Davis died on February 5, 2000 in Daytona Beach, FL at the ripe old age of 103. This entry was posted in American, history, Icons, motorcycle, sports, style, vintage and tagged 1910s, 1920s, American, board track, culture, dirt track, flat track, Harley Davidson, history, Indian motorcycles, motorcycles, photo, picture, racing, vintage. Bookmark the permalink. the old jerseys are awesome. HD brought out cotton replica ones a few years back but you couldn’t wash them warm/hot or they shrunk… cant see a lot of bikers getting all picky w their laundry… mine shrunk to hell. The jerseys are incredible, I love ’em. The last pic of Jim Davis in the intarsia “Indian” v-neck with dress shirt & bow tie rocks. gosh they’re all so super cool. More than super cool– TOTALLY LEGENDARY. I’m learning a hell of a lot reading your blog JP. Cheers! man, I was looking for some old clothes, vintage fashion…the pics are great!! really interesing blog keep it up! Great post, but you didn’t mention a salient point about these bikes, or at least the boardtrackers of the time: No brakes! And no throttle on the carb, which meant full-out all the time. 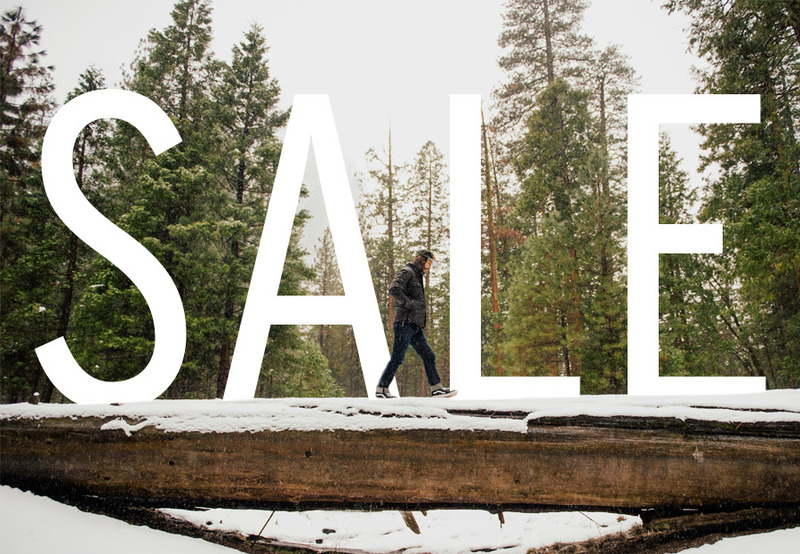 A thin leather helmet or turned cap, skinny and unreliable tires… . These guys were made of steel. ..love your subject matter…all after my own heart. The wife gave me Danny Lyon’s Bikeriders last xmas.